Asad Jooma will compete on the vault this week. Three members of the men’s gymnastics team have qualified for the NCAA National Championships, which will take place April 20-21 at the UIC Pavilion. 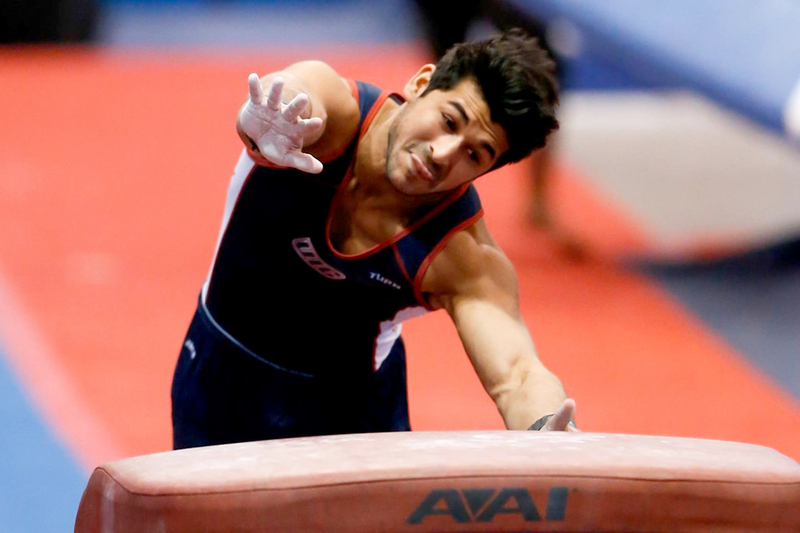 Asad Jooma, who will compete on the vault, had the highest qualifying score among individual qualifiers. Satchel Hudson is the first alternate in the all-around, and Colin Schwartz is the first alternate on the pommel horse. Jooma was one of the Eastern College Athletic Conference’s top vaulters all season. He tied his career high of 14.350 three times, including at the ECAC Championships, where he finished fifth. After peaking with 14.350s in consecutive meets, he upgraded his vault and still progressed back to his career-high level on the more difficult maneuver. His qualifying score was 14.175. “Asad is in a great position to have a great championship. He has a caliber of vault to qualify for day two and be in the top 10 in the country,” Nelson said. Hudson’s career high 74.950 all-around score at the ECAC meet was good for seventh place in the conference. The Flames’ top all-arounder the whole season, Hudson set career highs on five of six apparatuses. He averaged 73.463 for his qualifying score. Schwartz made the NCAA cut in his first season as a collegiate gymnast. He set a season high of 13.65 in the last meet of the regular season, which was also the top pommel routine by any Flame this year. With a qualifying score of 12.463, he will enter the national competition if one gymnast withdraws.